Turn forgettable furniture and ho-hum surfaces into showstopping home accents with this versatile and low-maintenance paint finish. Putting a new face on tired-looking home accents can be as simple as brushing on a few coats of paint. 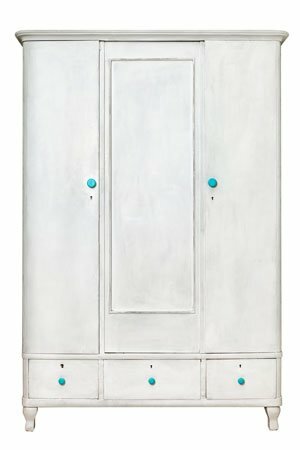 But if you want to achieve a unique antique-style finish, think outside the conventional can of latex paint and opt for chalk paint instead. A water-based decorative paint developed and made popular by Annie Sloan, chalk paint is a nondamaging blend of calcium carbonate, talc, and pigments that delivers a whimsical matte white finish with chalk-white undertones. It has become the veneer of choice for DIYers looking to revive their outdated wooden furnishings, although it’s also suitable for use on masonry, drywall, metal, glass, and fabric. Here’s how to use chalk paint—along with a list of basic painting tools and some useful information about techniques—to produce an appealing distressed finish on nearly any surface. If possible, work on your paint project indoors—chalk paint adheres best at room temperature. Protect the floor of your work space from paint splatter by laying out newspaper or brown paper underneath the item you’re painting. Detach any removable elements from the piece, including chair cushions, shelves, drawers, hinges, knobs, and other hardware. • Paint-covered, rust-covered, or high-gloss surfaces like laminates could use a light sanding with 150-grit or finer sandpaper in order to remove obstacles to adhesion. • Untreated wood should have a coat of clear shellac applied with a cloth pad before painting; cure it according to the manufacturer’s instructions. This coat prevents tannins in the wood from bleeding into the paint and altering the color. Using a soft cloth saturated in soapy water, wipe down the entire surface of the piece to lift dirt, debris, oil, and sanding dust. Give the surface a once-over with a clean, damp cloth, then let it dry fully. Cover any areas you don’t want to paint with painter’s tape. Purchase enough chalk paint in your favorite shade to cover the piece you’re working on. (Typically, a liter of chalk paint can cover 140 square feet—roughly the surface area of a small dresser.) Before opening the paint can, turn it upside down to loosen the contents, then shake it vigorously to ensure that the chalk paint is well mixed. • To use chalk paint with a brush: For a smooth, uniform finish, choose a natural-bristle brush with long, flexible bristles. Dip the brush into the can, and tap the handle against the lid of the can to remove excess paint. Then, apply the paint in unidirectional strokes to one section of the piece at a time until the entire surface is covered. • To use chalk paint with a roller: Pour the chalk paint into a paint pan, then load it onto a high-density foam roller (depending on the size of the furniture, a four-inch mini roller may be the best option). Scrape off the excess paint on the grid of the pan. Roll a thin layer of paint in a long, unidirectional stroke, then pull it back and make one more stroke in the original direction. Repeat this process until the entire surface is coated. • To use chalk paint with a spray gun: Chalk paint is a naturally thick medium that may not flow readily from all spray guns. You can get around this by watering down the chalk paint (adding approximately two tablespoons of water for every cup of paint) before loading it into the gun. Or, you can opt to load the paint as is and operate the gun at maximum pressure, preferably with a spray tip measuring at least 1.8 millimeters to enable the fluid to flow. To avoid risking damage to your spray gun, test this method on a small, inconspicuous part of the piece before tackling larger areas. Allow the first coat to dry completely according to the manufacturer’s instructions. 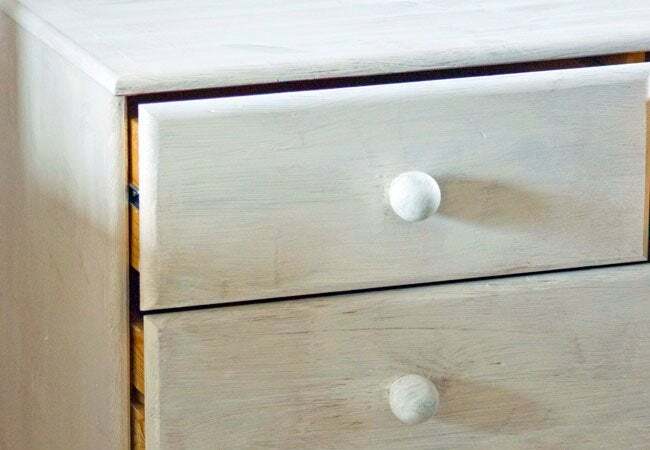 A single coat of chalk paint is sufficient for many applications. If, however, you need to cover any visual imperfections, or if you want to create a two-tone decorative finish in which the bottom layer of paint shows through around the distressed edges, you can opt to apply a second coat in the same color or a lighter shade. Now, examine the finish. If you want a more polished matte look, keep it as is; otherwise, to achieve a subtly worn patina—a finish that chalk paint is famous for—distress the painted surface with medium-grit sandpaper, focusing on the edges or details you want to accentuate. When you’re happy with the finish, seal the paint with one or more coats of clear or tinted wax, gently massaging the wax into the painted surface with a soft wax brush. As a rule of thumb, use a 500-milliliter tin of wax for every three to four liters of paint. Although wax can dry in less than a half hour, it’s best to let it sit overnight. Total curing of the wax can take up to three weeks, although the furniture is ready to use as soon as the wax is dry. Finally, reinstall any hardware you removed from the piece, and let your chalk-painted accent shine!